I pre-ordered one of these a couple of months ago and just received it, and since its major new feature is the ability to sync notes to Evernote, I thought I'd post a quick review here. In short, this is finally the handwritten-note and sketching input device for Evernote that I've been waiting for. If you're not familiar with the Boogie Board's basic technology: they all use a very simple screen that isn't a display at all, but basically a liquid crystal sheet that reacts to physical pressure by going from black to white (or really a light green). It has no ability to display content or selectively erase; you can only draw on it, and clear the whole screen, kind of like an etch-a-sketch. That makes it sounds really limiting (and it is in a way), but the thing it does really well is feeling much more like pen and paper than most technologies. There is zero lag (since it's just reacting to physical pressure of the stylus tip, which is just a piece of plastic), pressure is registered in different line widths, and it glides like a pencil on vellum. It feels really good to use; you need to try one to understand. If anything, the Sync has improved the feel over previous versions of the screen technology, with crisper lines that make it even better for small details like handwriting. But I've had one of their basic boards for about a year and because it's so effortless to grab and use, I have used it constantly as my scratchpad for notes and sketches, occasionally taking a snap of the screen with my phone to get something into Evernote. I can't stand the feel of all of the various iPad styluses I've tried, and so even though it's cumbersome to "save", the Boogie Board has been my hacky solution. The big update in the Boogie Board Sync is the ability to save drawings into internal memory and sync them out. It uses exactly the same screen technology, but now it includes a proper magnetic digitizer layer so while you're writing or drawing, the Sync knows where your pen is, and the pen registers pressure on its tip (you now have to use a special pen, although it's unpowered and very light). So technically it has no awareness of the state of the screen, but it does know where the pen has been and how much pressure you've used. It saves that information to its internal memory when you push the "save" button, providing a quite good capture of what you've written or drawn. Since it's not "scanning" the screen but capturing the path of your pen, the data is available in vector format (with pressure included), so you can get access to very nice PDFs that can be enlarged or scaled freely. You get get files off of it either by connecting it via USB or bluetooth to your PC and using the free desktop software, or by connecting the Sync via bluetooth to your iPhone and using the free iPhone app. I believe there's also an Android app coming soon, if it's not already. Both pieces of software can be set up to grab your notes and export them immediately to Evernote (and a few other options), making it a really frictionless way of getting notes or sketches into Evernote. Draw -> push save -> launch iPhone app -> done. It's fantastic being able to just grab a single-purpose device, immediately start writing or doodling, and then pull multiple pages off effortlessly whenever I want them available in Evernote. A bonus feature that I wasn't even aware of when I bought it, but which has kind of blown me away, is the ability to plug it into your PC via USB and use it as a drawing tablet, Wacom-style. Although the options here are limited right now, it actually does remarkably well for this. It senses the pen when it's around 1cm from the surface and takes control of the mouse. Touching the pen tip to the tablet creates a mouse click, and the single button on the side of the pen creates a right-click. The desktop software even has a little whiteboard mode where you can draw directly into a page on your computer. I plan on just leaving the Sync tethered next to my keyboard and using it as a drawing tablet when I don't have it disconnected to use it in its normal standalone way. Very cool, and helps further justify the $100 price point (which may seem a bit steep for something so relatively simple). The big downside is still that there's no way to erase or recall previous drawings, so this certainly isn't going to work for somebody who wants to complete detailed drawings. Also there's no backlight and the contrast is honestly quite low, so you'll need to have some light available when using it. However I can see this being ideal for people who want a note-taking device, or who like to do lots of quick sketches on the go (it's now replaced my engineering notebook totally). In a lot of ways, it's like the Wacom Inkling, but having bought and used an Inkling, I greatly prefer the Boogie Board for the precision of capture and much more useful enabling software (including Evernote syncing). I'm attaching a note I created on my Sync to this post to give you an idea of the raw output quality. I chose to export a PDF (so you can look at the details if you want), but you can choose other formats if you prefer. Be nice -- I'm an engineer, not an artist, so it's very sketchy. Unfortunately these are in really short supply right now; amazon isn't even taking preorders at the moment in the US (although they're supposed to start again in January). Certainly if you have a chance to try one out, I really recommend it. Otherwise, I think it's worth considering if you're not happy with the existing tablet input options for Evernote. And like you, I think they are great for taking a quick note while on the phone (I can't seem to use a computer/device to take notes while on the phone - I need to write...) or just making a temporary list. As you said, this is the closest feel to using a real pen/pencil & paper of any device I've used. Well, I do have a Wacom tablet & it's pretty great, too. Anyway, I use the Boogie board quite often & like you, often take photos of the screen & send it to Evernote before clearing the screen. I've wanted one of the USB ones for a while but really didn't have a need for it. But I'd not heard of the latest version. I like the idea of being able to send to Evernote directly. OTOH, since I guess you have to use an app to sync from Boogie Board to EN, I guess it's not any different than what I do now, since I use FastEver Snap on my iPhone to take the photo & it auto sends to Evernote. I'm fascinated by the Boogie line & if I could get a RIP or SYNC model for a really good price, I'd jump all over that. With the introduction of the SYNC, maybe I'll keep an eye out to find RIPs clearance priced. But again, the biggest drawbacks are the lack of being able to recall saved notes or selectively erase. So it seems like until they get those things figured out, it's still going to be a niche product. And one advantage the Boogies have over most tablets/smartphones is you can use them in bright light. Yeah, it kind looks like an e-ink display (although it's not), although reversed -- ie. the page is black and you write in white. I have mine in hand and have been trying to put it through it's paces. I have to say there is some incredible cool stuff going on here. I also have to say that it doesn't feel like the software for the thing finished it's development cycle. There are all kinds of interactions with evernote possible - but it really isn't doing a whole lot. I'd love to have the basic VDC (the name for the Sync's PC software) simply ask me what notebook I want to synchronize with in Evernote - it simply dumps everything into your default notebook. Which could be ok, but mine is contact related stuff. I guess I will have to figure out how to get Evernote to move the stuff to a notebook for drawings or labeled "Sync" or something of that ilk. The "digitizer mode" or wacom like behavior was an unexpected bonus for me as well - I saw a few demo's and it never got mentioned. I'm not sure how it stacks up - but handy none-the-less. I used it lightly in Illustrator and it was quite usable. I'm also not an artist - so I would defer to a professional with more experience with a tablet to provide input there. There are some quirks which are not working (software related no doubt) with my device. It doesn't work in whiteboard mode (doesn't receive input from the Sync), but will cause an erase call to the tablet if you click the software erase button. So that feature is useless for me. (And the same is true for the Android app - no white board mechanism). The Android app doesn't download from my Sync properly, so there is a disconnect there. I could write more - but it would be simply a Sync review without any interaction with Evernote described. I can generalize this way though: this device is very close to being the kind of thing I would use 24/7 for note taking, sketching, doodling if the interconnection between it, my android (S4), and my laptop were polished. When/if the bugs are worked out and it delivers on it's potential - it could be the game changer that allows me to actually be functionally organized and not spend time moving things from a to b to z and spend precious time managing my organization as opposed to letting the technology do it for me. And I never thought I'd see the day when that really happened. The business potential for this thing is also through the roof for me... but not with the bugs and not until it is polished. Could you expand a bit more on how the sync differs in the ability to take notes, over previous versions? I have the boogie board 10.5 and I really wanted it to take notes but the writing just came out too chunky and the space was limited so it wasn't practical for college notes. It is great for math problems, but I want to take notes. Yeah, I know what you mean -- fortunately the Sync is quite a bit better in this regard, although they don't seem to be promoting the fact. Forgetting about the saving ability of the Sync, the line width on the panel of the device itself is significantly thinner (for the same amount of stylus pressure) than the old 10" board (which I also have). My guess is that since the Sync has the ability to save off nice high-precision images of notes, they decided that it would be used for more precise tasks (such as dense written notes) and so decided to bias the panel toward a thinner line, which also matches up fairly well with the line exported in the saved image from the Sync. Fortunately since I have both devices, I can show you the difference. 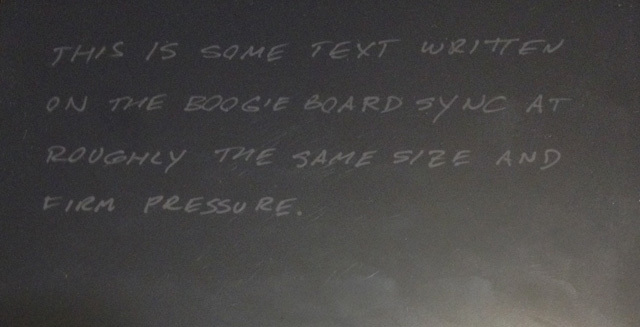 I'm attaching photos of hand-written notes taken on both my 10" Boogie Board as well as my Sync, as well as the PDF output I got from the Sync for that note. 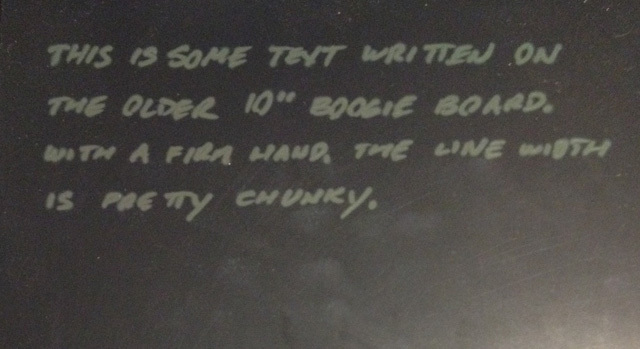 The fatter line width on the 10" is actually kind of nice for visibility of quick notes and rough sketches (probably why they did it that way for a non-saving Boogie Board), but I think you'll agree that the Sync is plenty suitable for dense note-taking. For reference, the characters in my note are fairly small -- a bit more than 1/8" high. Yeah, after using the Sync daily for a little while now, you do have a point; I've run into a log of buggy behavior on the iOS and OS X apps. Although in their defense, I've found them to be very responsive to bug feedback and they seem to be trying to fix up the software rapidly. I've been emailing back and forth with the iOS developer, and they pushed out an iOS update recently which seems to have killed the bugs I was encountering with the iOS app completely making it quite solid, including with automatic Evernote export. You may want to go back and try again with the latest iOS version (if you're using that). Hopefully the desktop software will similarly get some attention shortly. Thanks for the quick reply and the pictures, that is exactly what I wanted to know. BurgersNFries - I have two RIPs that I may want to part with. ymatto - Great posts. Also, your attachments were quite helpful. Thank you for taking the time to create and share them. The "chunkiness" of the writing was something I did not care for with the RIP. It definitely worked fine for the purpose, but since i tend to write with some pressure, I think it caused an issue for the RIP. I purchased a BB Sync and have been using it since the first of the year, I really like the feel of the device and especially like the Live Feed capability. As a teacher, I can use the BB connected to my PC and then to a projector for the entire class to see. It works great*. *However, I am having challenges getting my computer to connect to the BB via bluetooth. It keeps kicking it out. Is anyone else having these challenges? Any suggestions? @CHMYST - I've been, and still am, having similar challenges with the Bluetooth stopping working. I kept have to uninstall the device from the Bluetooth screen on my Windows 7 PC and then re-add the device - and even then, it didn't always work. I didn't know if it was the Sync that had the problem or the Windows 7 PC, so I set up the Bluetooth to work with my Nexus 5 smart phone. That configuration worked well (consistently). So it was the Windows 7 PC that had the issue. Since then, I installed the updated (v3?) Bluetooth on my Windows 7 PC and things have been better, but not perfect like when I'm connected to my phone via Bluetooth. Hope this gives you some help. Just FYI for those reading this topic: I reported a number of bugs I was seeing in the bluetooth connection to the OS X desktop software, and a couple weeks ago they released an update that seems to have addressed everything. This doesn't necessarily carry over to the PC client I realize, but you guys on Windows may want to document and report the issues you're seeing (especially if you can give them a test path they can duplicate). They are definitely responsive. I just got a BB Sync today and am running the Android app for it along with Evernote. I have no idea where the files are going or how to access them in the Evernote menus. Are there any tutorials on using the BB Sync with Evernote on an Android 4.2.2 tablet? As for figuring out Evernote received those files I am still looking into that,. Thanks for the demo PDF. I am using a Samsung tablet with S Pen, and while good, it still feels somewhat lacking in the digitizing accuracy and especially the latency }it is also quite expensive, heavy and battery hungry for everyday use). I have tried ordinary Boogie Board, I liked the immediate response and good presure sensitivity and now I am considering buying BB Sync. Before I do, I would like to confirm how well the digitizer works. - are thin and thick lines distinguished in the PDF capture? - how about fast strokes / lines - are they reproduced accurately? The best way would be to draw something with thin and thick lines and some handwriting as well, and to post the resulting PDF side by side with the screen photo of the device, so that it is easy to compare the caputre quality visually. I ended up getting a BB Sync & have only played with it for a awhile. I have to say, the reviews about it being difficult to read are accurate, IME. Definitely not as useful as the non sync models. But the notes synced to the BB app & ultimately to EN are very clear. IIRC, there were some suggestions about how to make the device more legible but I've not had the time to cull them & try them. I'll post an example file up here once the Evernote DDOS attack is resolved and I can actually sync notes again. Okay, back up and running! 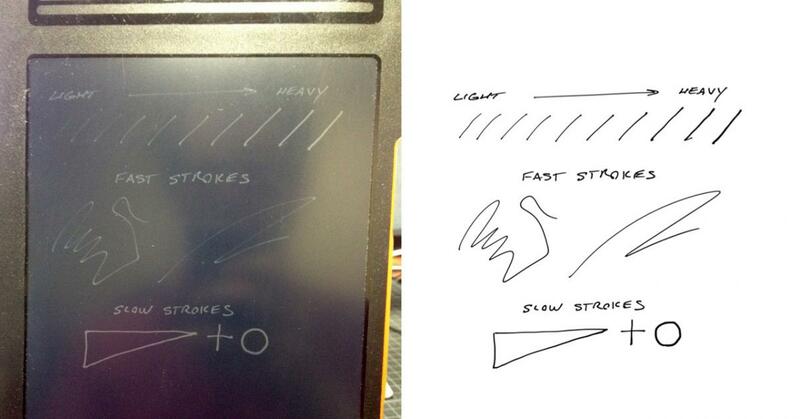 Here's my attempt at a controlled side-by-side comparison of strokes on the BB vs. the PDF output. I tried to cover the range of pressures that produce lines of different appearance (from barely-registered to not-getting-any-thicker), and for the fast strokes I tried to move the pen as quickly and tightly as I could to try to "fool" the digitizer. I think the results are quite good for both stroke weight and accuracy with speed -- much better than I've seen from a tablet computer. Of course there is still the big tradeoff of the BB "screen" being extremely low contrast (and of course not really a "screen" at all, so much as a writing surface you can clear). But setting that aside, the actual digitizer technology I find to be quite good. No calibration, just works the way you'd expect. Excellent, thanks a lot - after my experiences with other devices I did not dare to hope it could work like this. The differences seem to be really small. If I am not asking too much, could you also attach the PDF file itself, so that detailed inspection is possible? Sure, no problem. Here is the PDF. The Evernote synchronization with the Boogie Board Sync and my iOS device, for me, is not to my liking. What happens is I have to launch the Sync iOS app, then launch the Evernote iOS app, and the BB_XXXXXX.pdf files then go to my "default" Evernote notebook. I would prefer the BB_XXXXXX.pdf files to appear in a notebook of my choosing. Is this not yet possible? However, its still not syncing with Evernote. The images still have not appeared in any notebook. For your problem, it might not be sophisticated enough yet to select the notebook the folder should go into. SO if you use it often enough, maybe make a different notebook your default?